The three primary colours for paints and pigments are red, yellow and blue. All other colours are achieved by mixing these three. These should not be confused with primary colours of light (red, green & blue) or those used for printing (cyan, magenta & yellow). These are the colours which result from mixing the primary colours in equal proportions. 50% red + 50% yellow gives orange. 50% yellow + 50% blue gives green. 50% blue + 50% red gives purple. These colours are those lying halfway between the primaries and the secondaries: 50% red + 50% orange gives red/orange, etc. It is customary to show the colours in a circle or wheel, which was first described by Isaac Newton. 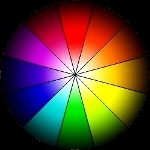 Complementary colours are those which lie opposite each other on the wheel - red and green, for example. These colours produce the highest contrast when placed together. The hue of a colour is an indication of whereabouts it lies on the wheel, i.e. which part of the spectrum the colour occupies. Intensity refers to how bright or vivid the hue is. Left is a colour wheel with zero intensity values at the centre changing to full intensity at the outer edge. Mixing a colour with a shade of grey of similar brightness will produce these more muted colours, called tones. Intensity of colours is often called saturation. The value of a hue, is a measure of how light or dark the colour is. Colours mixed with white are called tints and have a higher value than shades - colours mixed with black. 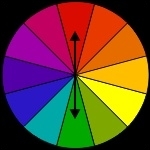 The colour wheel left shows different values, starting in the centre with off white, and finishing at the outer edge with near-black shades. The colour wheel is often divided into two halves - warm and cool colours. 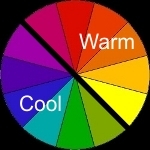 Warm colours are reds, oranges, and yellows, whilst greens, blues and purples are defined as cool or cold colours. The appearance of a colour is very much dependent upon its context. The surrounding colours have a great effect upon how the brain perceives a given colour. The image on the left is composed of only eight colours, but notice how the green square appears to almost shimmer against the red background on the top line. A similar effect may be noticed for each pair of complementary colours. All the colours appear slightly darker viewed against the white background, and lighter against the black. Conversely, the orange squares appear to almost blend in against the red and yellow backgrounds. So we finally come to something we can use to help select colours to create accents on a miniature or building. The greatest contrast will be produced by using a hue in a complementary colour to its surroundings. Green gems will stand out most against a red back ground, for example. In addition, using colours which have similar hues will produce a more harmonious appearance - choosing one third or less of the colour wheel, and limiting your palette to those hues will give far more subtle results than selecting colours from just anywhere. Another way to produce contrasts, is to use a light colour against a darker one. The image on the left uses exactly the same hues as the previous one. The red, yellow and blue have been darkened to about half their previous value, whereas the other three colours have been lightened very slightly. In terms of paint, I have added black to the red yellow and blue, and a little white to the secondary colours. Notice how the contrast between the different colours has changed quite dramatically. The red and orange appear far more distinct against each other, as do the blue and green. Notice also that the yellow takes on a sort of dirty green/brown appearance. This effect happens with paints too, and a "dark yellow" colour is usually achieved by adding a little red or orange, rather than black. A near opposite effect happens when a red colour is tinted - we even give the resulting light red colour a different name: "pink". In this case, the usual trick is to add a little yellow to the colour, rather than white. This image contains 14 colours. The background colours have been reduced in intensity, whilst the foreground squares remain at full saturation, i.e. exactly the same colours as used in figure 9. Notice how the foreground colours appear to be less vivid, although they are the exact same ones used in image 9. Rather than giving high contrasts, the use of a less intense colour palette will produce a far more subtle appearance. Many thanks to Yamagata for giving me permission to use this image. 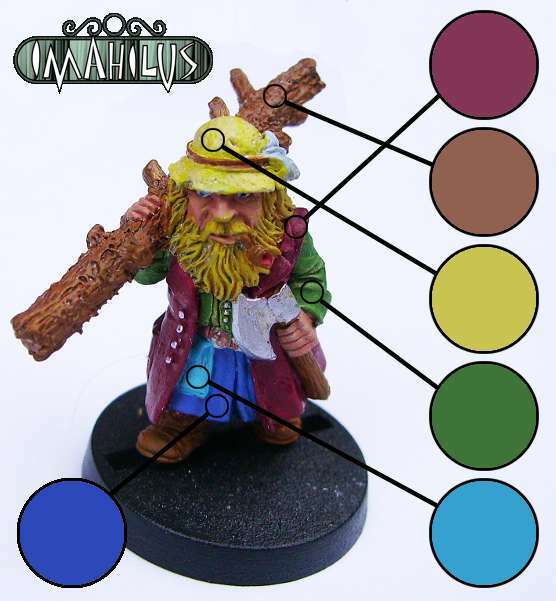 I hope this will help to illustrate how the above information can be used to help select colours for a miniature. Notice the very limited colour palette which has been used - essentially just shades of three different colours. The first is silver, which is basically a neutral mid-grey colour. Observe how these areas of the model do not particularly stand out, other than the areas of high contrast in value. This is especially evident on the breastplate, where we can white juxtaposed with black. The other two hues are almost exact complements of one another. The copper colour is basically a muted red/orange hue. This contrasts beautifully with the green, which is more towards the blue part of the spectrum than the yellow. 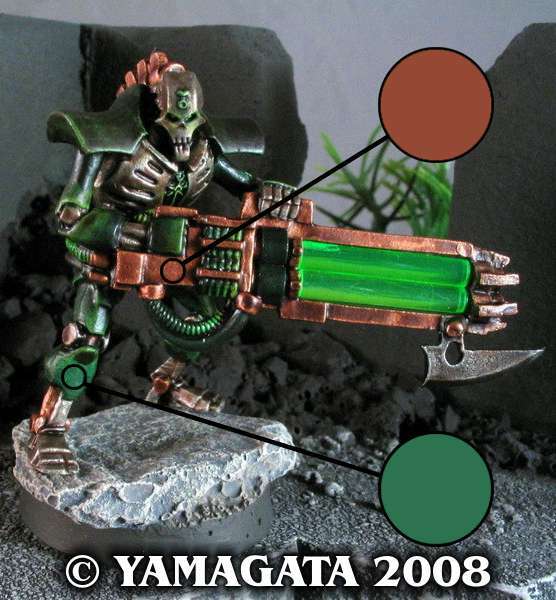 The much more vivid green of the weapon makes this feature of the miniature stand out most. Notice also the very dark shading around the head, which serves as a frame, and draws attention to the face. Here's a different example, this time to illustrate the effect of keeping all the colours confined to a small sector of the overall circle. Notice that nothing particularly stands out here. The selection of browns (which are actually muted reds and oranges) gives the figure a more harmonious appearance, despite having a broader range of different colours than the example above. The biggest contrast on this model is on the metallic areas, where black shadows and white highlights occur in close proximity to each other. All the other colours in the palette are similar in their muted intensities, and closely related to each other in hue. So, the biggest contrast here is between the different lightness values. Even then, the lightest colour has a value of around 80%, and the darkest about 35%, so there is nothing extreme to provide any high contrast. This third example serves to illustrate the effect of using colours from a much wider area of the colour wheel. Many thanks to Imahilus for allowing me to use this image. Firstly, notice that all the colours are fairly similar in value and intensity, and there are hues from about 3/4 of the available range. Starting with a purple/red right round to a blue, with an orange/brown, yellow, green and turquoise between. So whilst the figure is very neatly painted, the overall result is somewhat confusing, without an obvious focal point. 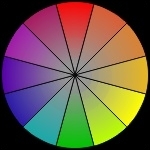 There are many ways in which this figure could be simplified: darken the orange, red, green and blues, leaving the yellow as the focus; replace the green and blues with a single, far less intense colour - a slate blue/grey for example; replace the red with another blue or green shade; and so on. In the end it depends on what the figure is for - this dwarf is fine as a single character model, but a whole army in these colours would look very garish. 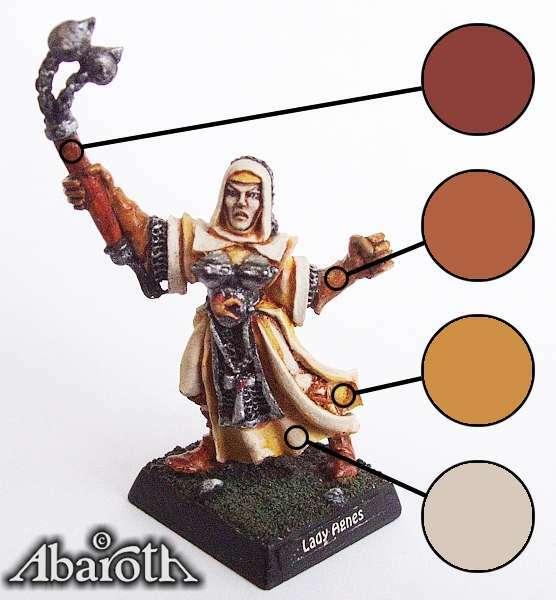 There are an infinite number of colours and colour schemes available to be used on any figure or other model. I hope the information and examples presented here, will help to make some of those choices easier. In the end, much can be learnt by experimentation, and many people make these choices instinctively, without realising why they work well. If all else fails, remember the first rule - have fun with it.